If your gonna use the Asus MB don’t forget to order the long USB 3.0 Kabel and short heatpipes (only needed one). 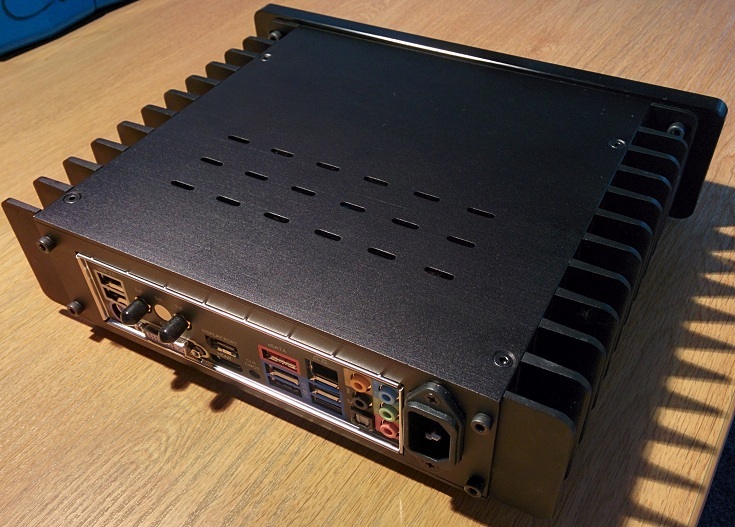 It turned out a real beauty (but the assembly takes awhile) I use it as an HTPC running OpenElec 4.0 Beta 2 at the moment. Don’t really want Microsoft on it. Temps are great: idle 40-45 degrees Celsius (depending on which Skin XBMC is running), playing a 30GB remux I had 45 degrees Celsius … after 10 hours of playing non stop the temp only went up by 1 degrees Celsius. Thanks to Larry for sending me the longer USB 3 kabel and 2 short heatpipes weeks before I even received my H1.S. 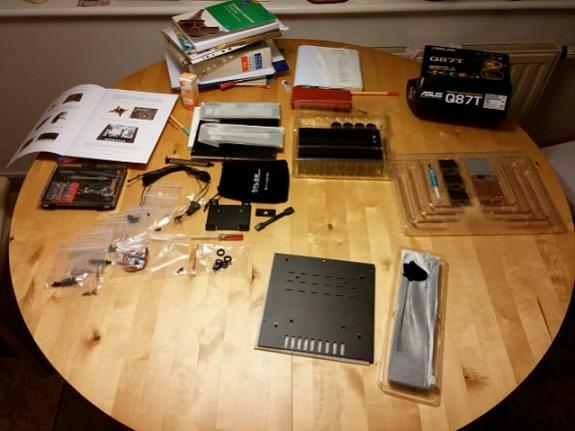 The following is a short review and summary of my experiences building a silent Media Centre PC based around a HD-Plex H1.S case. 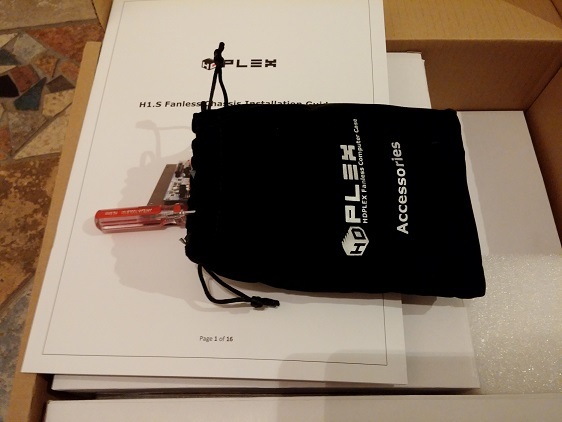 The H1.S parts kit is comprehensive, with everything individually bagged and logically grouped, and the packaging is excellent. Unfortunately, the packer had placed the (heavy) main box on top of the optional items (PSU’s, etc) which had then become badly crushed in transit. However, the components inside survived without harm. The build was fairly straightforward and took me about 3 hours. 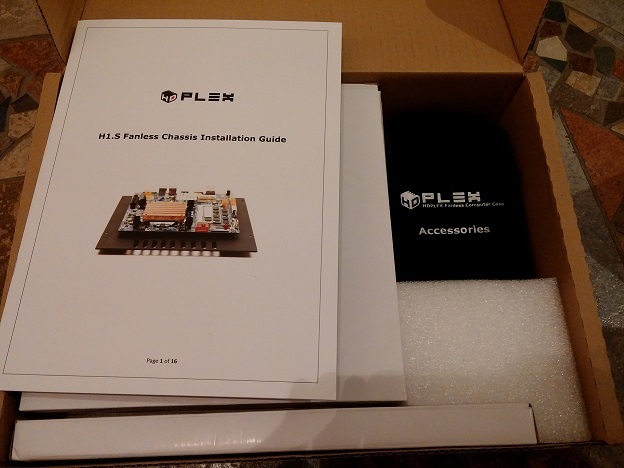 The assembly guide can be vague at times and assumes liberal use of common sense, but otherwise is well laid-out and covers most of the installation permutations. The H1.S “Installation Screw Picture Guide” is a very useful supplement to the printed material. I roughly followed the assembly guide and the only correction I would make is that the user should install the back panel before screwing the top plate onto the heat pipes. It’s necessary to spread the two side plates slightly to fit the rear panel and this is impossible once the pipes are fixed down. Other than that, things were pretty easy and the H1.S is a well thought out product. I first of all assembled the PC on the bench to ensure the components worked and to establish a baseline operating temperature using a conventional fan cooler. After an hour of Prime95 the machine reached a stable CPU temperature of 58C. The RAM, Southbridge and VRMs were cold to the touch. I used my own heat-sink to cool the two PSU modules but a better solution is to fasten them to the H1.S faceplate using their proper mounting holes. My previous experience with passively cooled PCs is that the VRMs and Southbridge depend on a small amount of airflow from the CPU fan to keep temperatures in check. Hence I stacked two 4mm thick blocks of Gap Pad thermal materiel (not supplied with the H1.S, but readily available online) under the VRMs, CPU and Southbridge chips before screwing the motherboard onto the baseplate. Generally, about 20% of the heat from each of these components can be conducted downwards using Gap Pad or a similar material and this helps make up for the lack of airflow. The thermal pad inside the DC-ATX power supply looked uninspiring so I also put a full sized lump of Gap Pad in there too. After completing assembly I re-ran the same stress tests on the finished item. The resultant CPU temperature after an hour of Prime95 was 76C and the chassis became uncomfortably hot to the touch, especially the front plate. 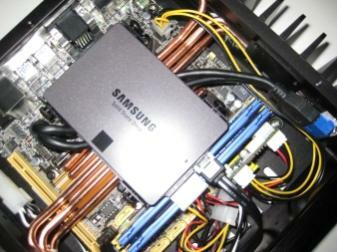 The whole interior, including RAM and SSD, were approaching the chassis temperature of around 55C. These temperatures are above the maximum rated for the CPU and are generally too high for comfort. 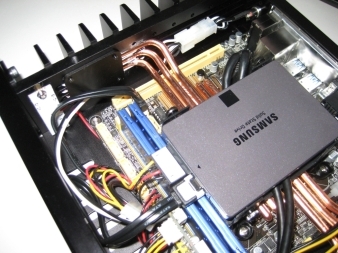 The heat pipes and Gap Pad do a good job of getting the heat to the exterior of the case but the chassis is under-finned for dissipating such power levels to the surrounding air. I then installed the Intel Extreme Tuning Utility and played around with the Dynamic Voltage Offset to under-volt the CPU. Note that I am using a standard i3-4130, not one of the low power T-series versions. The Intel utility is handy as it allows the voltage to be adjusted and tested on the fly without rebooting the machine each time. To my surprise I could reduce the Vcore by as much as 180mV and still remain stable (the machine crashed at 200mV). After an hour of Prime95 the machine settled to a steady state CPU temperature of 66C and a chassis temperature of 46C. Although not as good a result as the shoddy Intel box cooler achieved, I find these numbers much more acceptable. A side effect of this tweak was to also reduce my idle power draw by a couple of watts. Once I’d established a stable under-volt using the Intel utility I made this change permanent using the CPU Voltage Offset setting in the ASRock BIOS. I didn’t try reducing my power consumption further by under-volting the GPU or testing maximum power consumption using FurMark, but these remain on my to-do list. I bought the ASRock motherboard as it was an approved item for the H1.S, but there are a couple of issues with it that HD-Plex don’t make explicit – namely the position of the USB3 header is not compatible with the very short and incredibly inflexible cable supplied and that the vertical CMOS battery fouls the heat pipes unless remedial action is taken. Neither issue is a big deal, but it would be better if the HD-Plex approval was caveated appropriately. I bent the last two heat pipes around the battery, making sure they didn’t touch either the battery case or each other and taking care not to crimp them. 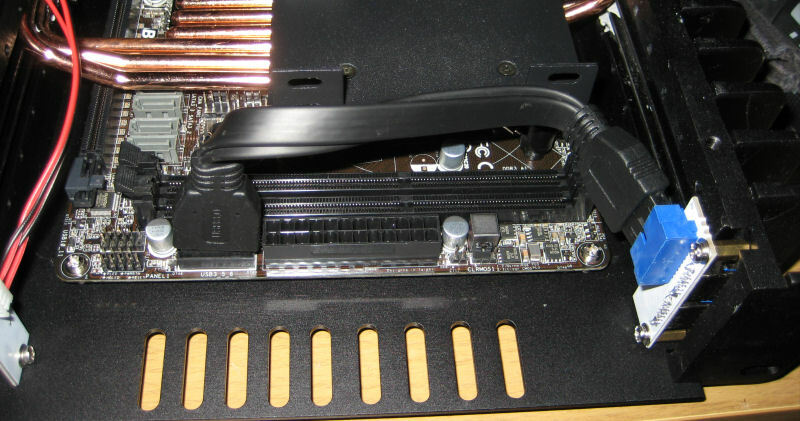 Although there’s plenty of room inside the case in this region, the bent pipes mean the SSD mounting tray can only go immediately over the CPU rather than being offset. This is undesirable as a good deal of heat is then transferred from the CPU to the disk, raising temperatures more than necessary. I read on the HD-Plex forum that shorter pipes are available but I got no response when I inquired about them. 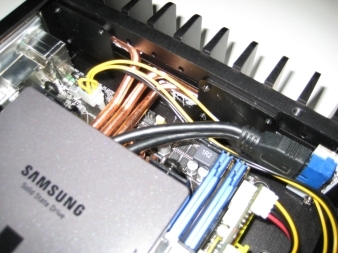 If both the AC-DC and DC-ATX power supplies are used, the area immediately behind the faceplate becomes crowded, with a rats nest of wires struggling for space. It would be impossible to also fit the thick and inflexible USB3 cable from the USB3 header in this region to the external connector (shown in blue at the bottom of the picture), even if the wire was long enough (which it isn’t). It would be much better if the case were 10mm longer to give more space here. 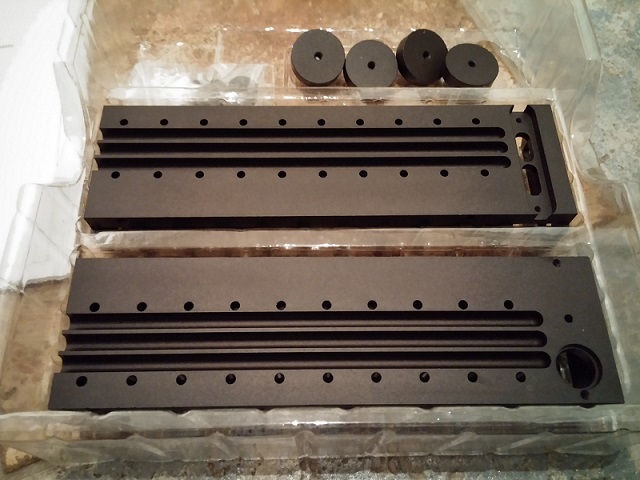 The H1.S comes with three mounting plates for securing the heat pipes to the chassis sides. I turned one heat pipe around on the left side to more evenly spread heat over the side wall and would have done the same on the right if I had a fourth mounting plate. Under heavy load there is a noticeable cooler spot on the right of the chassis, just behind the power switch/LED, which could be utilised if a fourth mounting plate was supplied. There is no such cool spot on the left side due to the third pipe being mounted forward. Overall, I am very pleased with the result of my build. The assembly process was pretty straightforward and produced an attractive computer with excellent performance for my needs. It’s small, unobtrusive and completely silent so I had no difficulty integrating it with my other AV equipment. It consumes so little power I don’t bother switching it off when I’m not using it. The H1.S case has been a success, though I think a slightly lower power CPU would have been a better choice for it. I think the case would be improved by more fin area and a better place for the SSDs could be found but otherwise it’s a fine piece of equipment. 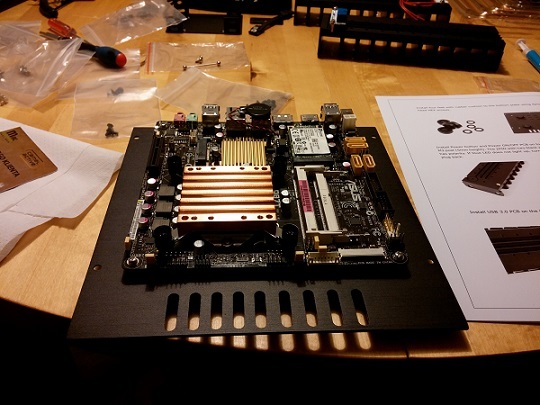 This is my first ASRock motherboard and it has been a pleasant surprise. It has worked flawlessly from the start and, for me, the combination of AC WiFi, ALC1150 audio and Displayport make it a superior product to the equivalents from Asus or Gigabyte. My assuptions was to replace mid-2012 Macbook Pro 13″ with something more powerful. I spent months to make a decision. 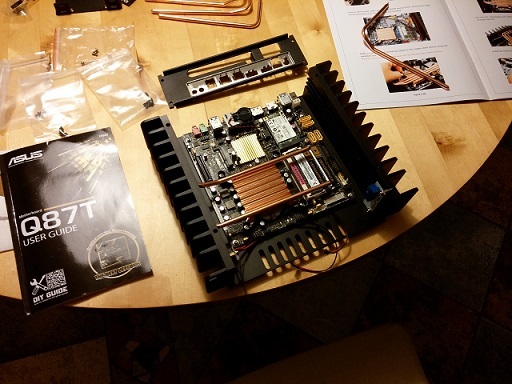 It was hard to choose between ThinITX and MiniITX due to lack of good mobos. Finally I decided to make completly silent and powerful workstation based on Asus Q87T which is very nice mobo with 2 ethernet cards and displayport. The greatest weakness is of course lack of discrete graphics but for work I do – it is not a reason. I live in Poland and it takes two weeks to get it. I have to say that Larry make good impresion on me. Initially I ordered case with internal power supply which is not obligatory and made payments for that. It was no problem to cancel only power supply part and make refund. The first impression of case was really good. I have to say that it was a really solid packaging and nice accents like black bag for screws. It’s something like DIY pack which is nice in the don’t-ever-try-to-fix-me-times. You have to assembly everything by yourself and it has something common with assembling a gun. 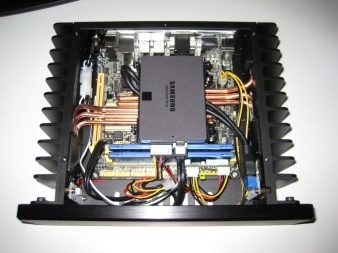 But there is a bitter part of this review: It is my first HDPLEX case so lack of experience means lack of confidence. 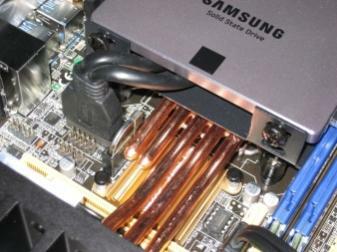 After mounting copper plate on CPU I had a problem with heatpipes. It was like the copper plate is about 5 mm too low. But after email conversation with Larry I choose to try a brutal method. 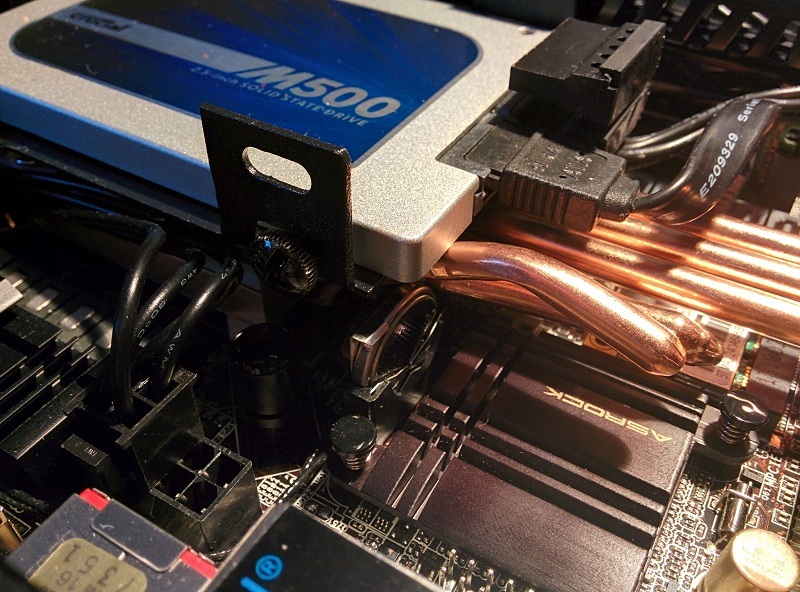 It was good decision because heatpipes were very platic and after covering it with aluminium top plate everything fits perfectly. PC started perfectly from the first try which was a small victory. Temps is very nice and case is not even warm. My test gives max 77 degrees after 30 minutes of 100 % CPU & GPU which is awsome. I’m very satisfied with final effect showed on the last picture. 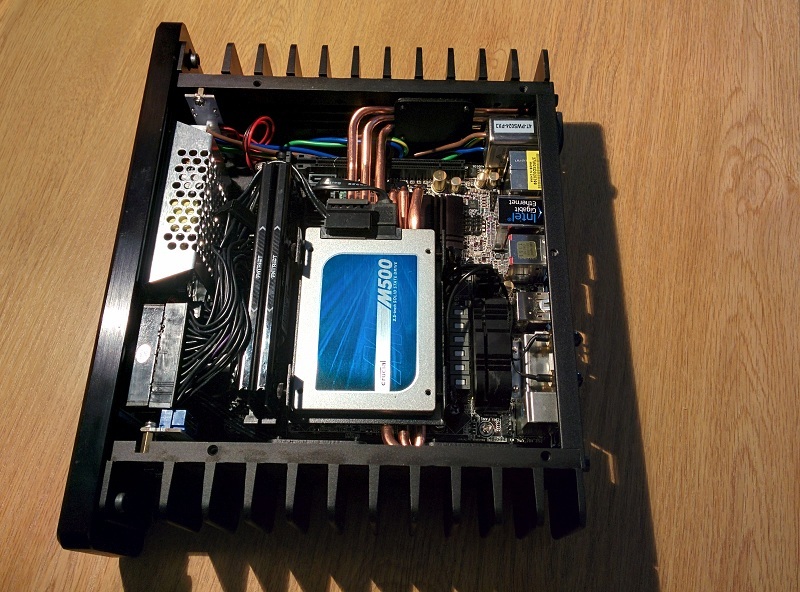 I recently replaced my HTPC and main system with the latest Haswell goodness. Decided on the HDPLEX H1-S case for both and I don’t regret it. The picture above is from the HD-Plex gallery. My own crappy pictures below. Putting the stuff together was time consuming, as always with the heatpipe cases. Even the power button required assembly. Built the HTPC first and everything went fine. Messed up a bit with the main system and ended up having to take the system apart and reassembly due to insufficient contact between CPU and heatpipe block the first time. The internal USB3-cable was a little bit to short, have ordered an extension. 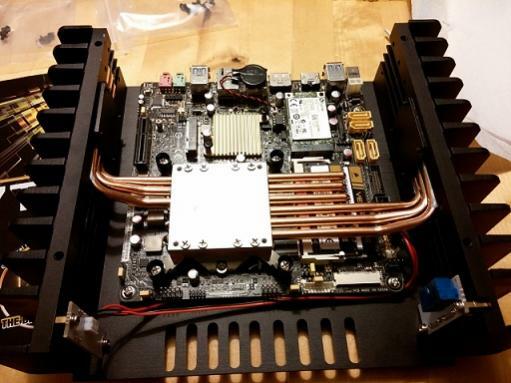 Due to the heatpipes not all motherboards fit in the H1-S. There’s a hardware compatibility list on the HDPlex site. 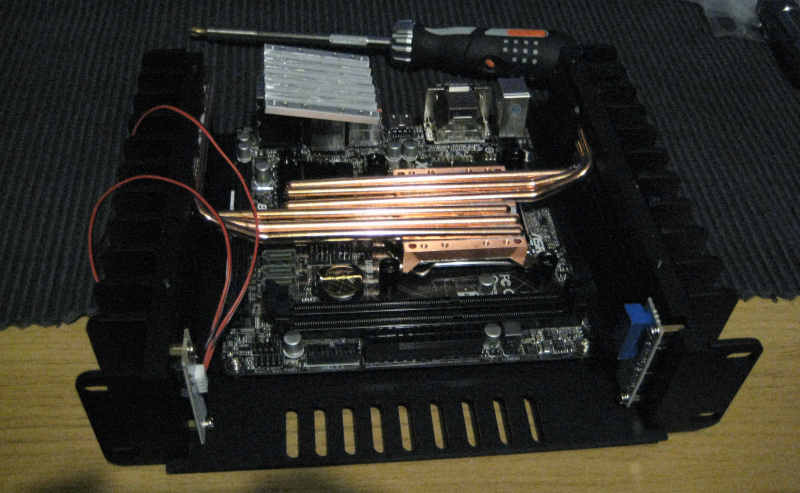 The ASRock boards works fine, but a USB3 extension cable is needed for the B85M-ITX. 1. Idle is empty desktop a few minutes after startup. Monitor/TV connected, mouse, keyboard and NIC. 2. Idle temps are low 30s on both systems. On the HTPC if I start mprime temps jumps to low 40s then slowly rises. On my main system the temp jumps quicker, high 50s and slowly rising. Don’t know where it would max out but I’m not worried about temps, these systems will not be used for any heavy stuff.